This post is sponsored by Pistachio Chewy Bites. I love working with a company that is dedicated to helping people live a healthy and wholesome lifestyle year round. Pistachio Chewy Bites wants to encourage you to continue your active and adventurous lifestyle into the winter months! These are our favorite winter trail snacks- just salty and sweet enough, and packed with protein (and won't freeze in your pack). Find them at Harmon's or Kroger/ Smith's Markets. As we’ve gotten our first snow in Utah, this is the perfect time of year to get ready to explore the sparkly magical trails. Reclaim the trails this winter! 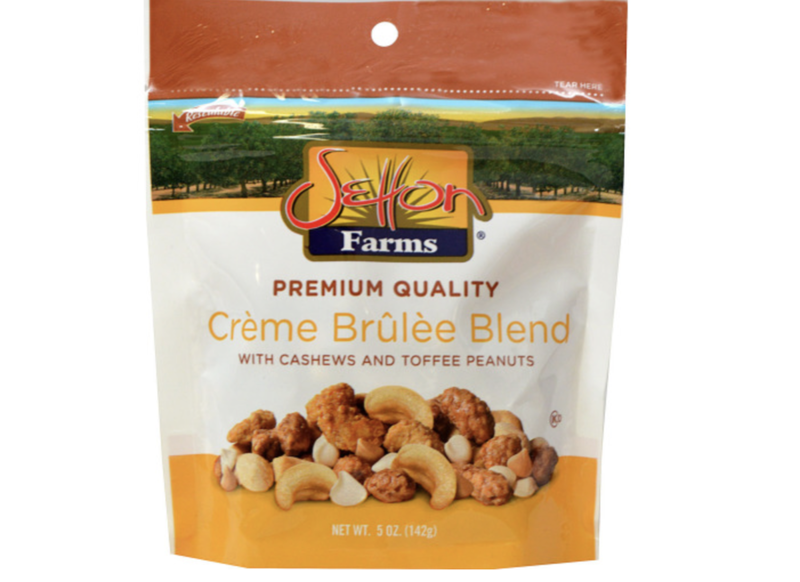 See Huck hanging out in the Chariot munching on the Setton Farm's Creme Brûlée Blend? It's his favorite flavor! Hiking in the winter with your family can be the most idyllic and other-worldly experience.... until you actually head out to do it for the first hike of the season. I consider myself to be somewhat of an experienced winter hiker, but without fail I find myself flustered and sweaty as I stuff Huck’s hands into his gloves before we head out for that first winter hike on the trail. But after that first hike of the season, our process becomes more streamlined, and exploring the winter trails feels natural. 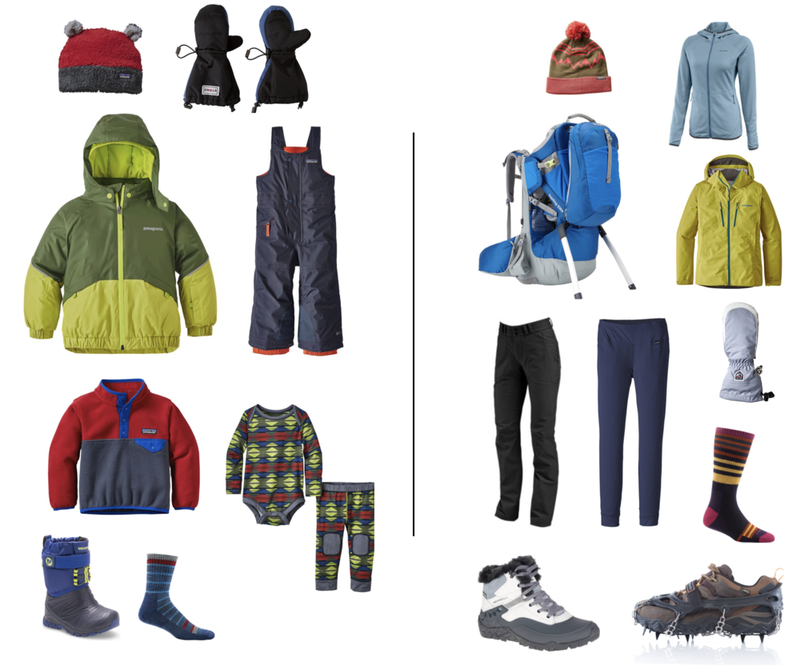 Having the right gear is essential for traveling in the mountains during the winter. Instead of finding the first sale, take some time to research the pieces you need and shop around for the best price. Craigslist and Ebay are great places to find used kids gear (in Utah I also love KSL.com and Second Tracks). When I bought my first pieces for Huck, I usually chose more gender/neutral items, hoping to reuse them in future years. Be sure to bring plenty of snacks and hydration that won’t freeze on your hike. You and your little ones won’t really feel like eating and drinking much on the trail when it’s cold, but it is even more important! Remember that your body burns more calories when it’s cold, and that fueling up regularly will make the adventure more comfortable and efficient for everybody. 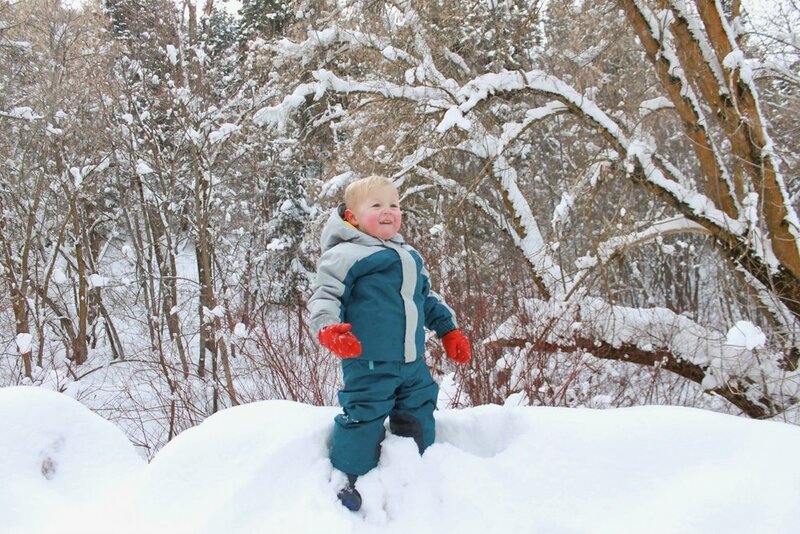 Winter isn’t the season to be lost on the trails for an extended period of time with your kids. It’s better to have a simple and more direct plan. You’ll definitely want to stay away from avalanche terrain while adventuring with your little ones. I have 5-10 trails that we do on repeat during the winter. Choose a few trails in your area that are safe and are fun to explore. We don’t have to get to the top of a mountain to have a fun time in the winter- the snow adds enough of a challenge, and all the sparkly surroundings seem even more beautiful and magical with the wintery crystals. We honestly cycle through the same trails all winter, but it makes it quick and easy to confidently get out the door without having to do a lot of research each time. I get a great work out in, and Huck gets some fresh, cold, mountain air. When selecting layers for winter hiking, start with a wicking synthetic base layer and finish with a breathable GoreTex layer. I usually have a mid weight layer (like a thin insulating jacket) and a lightweight down puffy jacket in my bag for myself and for Huck. Remember to bundle up children that are getting carried in one-two more layers than you are wearing, and to frequently check in with your little ones. Look for pieces that will you keep you dry (from snow AND perspiration) and will add insulation. I usually hike up the mountain in my baselayer and outer GoreTex layer, and put on my down jacket as soon as I get to the top. If I’m carrying Huck, he wears a baselayer, a fleece, and his down snowsuit. If he’s hiking himself, I’ll keep his fleece in my pack. I also pack an extra pair of socks in my pack for wet feet or to slip on under mittens as an extra layer. This is Huck's current winter kit. We've tried ALL the winter gear out there, but this is what works best for us! The Stonzwear gloves have been a game changer. I know it’s tempting to run inside and fire up the kettle for hot cocoa, but be sure to head back out while the water is boiling and grab all your gear and clothing. Don’t let yourself be disappointed when you head out for your next family hike and all the gear is damp. I usually prop our snow boots up next to the heater, and hang all our coats/snow clothes on chairs to dry overnight. During the winter it’s especially important to pay attention to the conditions of the weather, terrain, and the spirits of your party. If little feet are wet or toddler’s hands are cold, it’s better to turn back early than to insist on miserably slogging up the mountain. Keep your crew feeling excited about the NEXT adventure. Stop to build a mini snowman, study tracks, or have a snowball fight. Plan to stop for warm cookies or lunch after your adventure- your kids (and yourself) have earned it! We love the Setton Farm's Blends year round, but ESPECIALLY in the winter because they don't freeze in the cold. Available for purchase at Harmons and Kroger Markets.